In June 2002, the Province of British Columbia released Stormwater Management: A Guidebook for British Columbia. Within a matter of months, four members of the Guidebook team prepared a technical paper that explained the “BC process” to an American audience. The paper is included in the proceedings of a national conference co-sponsored by the United States Environmental Protection Agency. It provides a concise overview of the thinking behind the approach that has guided British Columbia for more than a decade. Held in Chicago in February 2003, the conference was titled National Conference on Urban Storm Water: Enhancing Programs at the Local Level. Attendees learned about state-of-the-art technologies and implementation programs that have proven success in local communities. “The organizing committee had heard that a presentation by Kim Stephens about the British Columbia experience was well received at a conference organized by the Oregon Association of Clean Water Agencies,” states Eric Strecker, Conference Organizing Committee. 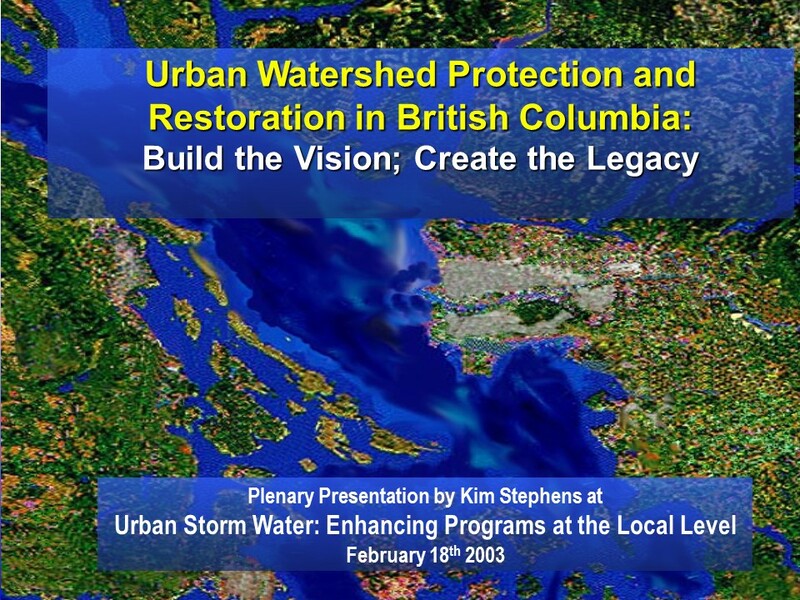 To download a copy of the Plenary Presentation by Kim Stephens, click on Urban Watershed Protection and Restoration in British Columbia: Build the Vision; Create the Legacy. Kim Stephens was project manager and principal author of the BC Guidebook. He was also lead author for the 2003 paper. He created the vision and was responsible for development of the Water Balance Methodology and then the Water Balance Model as an inter-governmental initiative. The co-authors of the technical paper about the BC process were Laura Maclean (Environment Canada), Ted van der Gulik (Province of BC) and Ed von Euw (Metro Vancouver). Ted van der Gulik and Laura Maclean were Co-Chairs of the Inter-Governmental Partnership that was formed in July 2002 to develop and implement the Water Balance Model. Ed von Euw was a key member of the Leadership Team that guided development of this scenario comparison and decision support tool. The Abstract is reproduced below. It captures the salient aspects of the paper which totals 17 pages. There is a logical link between changes in hydrology and impacts on watershed health, whether those impacts are in the form of flooding or aquatic habitat degradation. The link is the volume of surface runoff that is created by human activities as the result of alteration of the natural landscape (i.e. through removal of soils, vegetation and trees). When trees, vegetation and soils are replaced with roads and buildings – less rainfall infiltrates into the ground, less rainfall gets taken up by vegetation, and more rainfall becomes surface runoff. The key to protecting urban watershed health is to maintain the water balance as close to the natural condition as is achievable and feasible – by preserving and/or restoring soils, vegetation and trees. But accomplishing this requires major changes in the way we approach urban drainage, and in the way we develop land. Drainage engineers have traditionally thought in terms of flow rates, not volumes. In fact, at the site level we need to focus on how much rainfall volume has fallen, how we are going to capture it, and what we are going to do with it. UniverCity – A high-density urban community that is being developed by Simon Fraser University to house 10,000 people at the top of Burnaby Mountain in the heart of the Greater Vancouver urban region. Headwaters – A medium-density residential community that is being developed to house 14,000 people in the East Clayton area of the City of Surrey, a suburban municipality in the Greater Vancouver region. 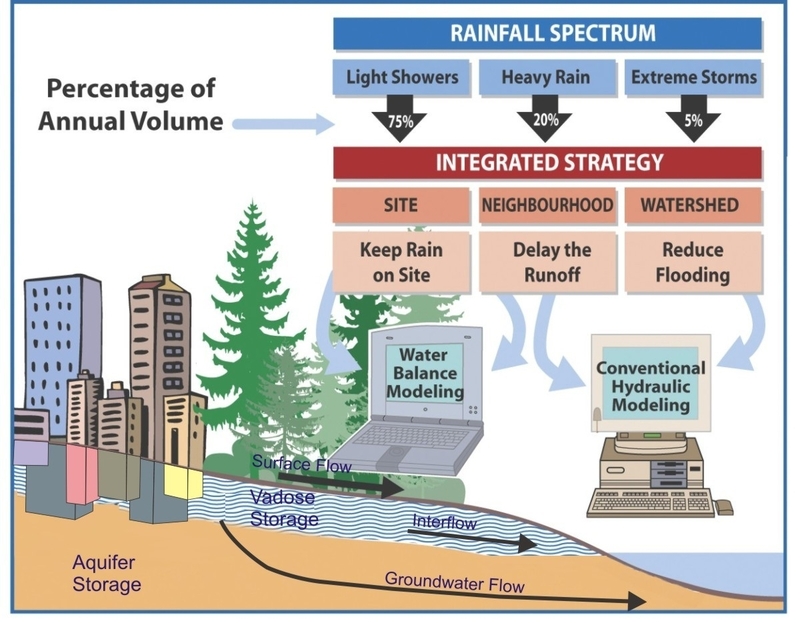 Through an inter-governmental partnership, a decision support tool called the Water Balance ModelTM (WBM) has been developed to help local governments integrate land use planning with volume-based analysis of stormwater management strategies. The WBM is used to evaluate the potential for developing or redeveloping communities that function hydrologically like naturally forested or vegetated systems. The tool creates an understanding of how, and how well, stormwater source control strategies for runoff reduction would be expected to achieve watershed protection and/or restoration objectives. To download a copy of the paper published by the United States Environmental Protection Agency in 2003, click on Re-Inventing Urban Hydrology in British Columbia: Runoff Volume Management for Watershed Protection. To download a PDF copy of the PowerPoint presentation that accompanies the paper, CLICK HERE.